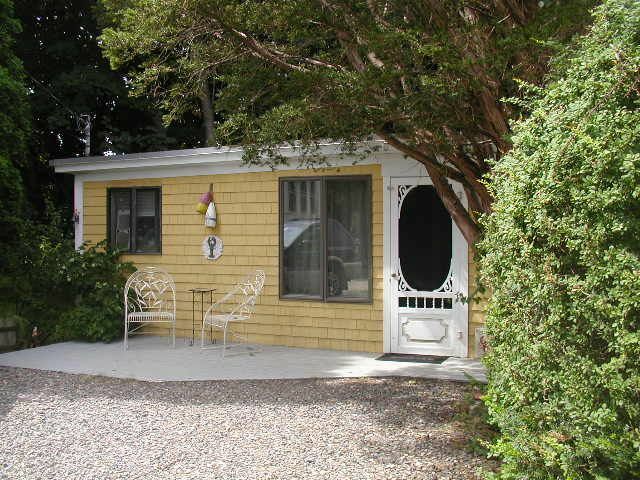 Cute cabin in a quiet area close to all the action in the York Beach area. ¼ mile to Short Sands Beach and ¾ mile to Long Sands Beach and the scenic Nubble Light House. Restaurants, shops, arcades and entertainment are just a short walk away. Cabin is nicely decorated and sleeps 4 in two bedrooms. One bedroom has a full size bed and the other has bunk beds. There is also a futon in the Living Room for an overnight guest or two. Open concept living room and kitchen area. Large outdoor patio area has lots of chairs for hanging out and has a dining table and gas BBQ. Patio is tucked away in an area with a canopy of trees. There is also a small front deck on the cabin with chairs for enjoying your morning coffee.